Funding for FRONTLINE is provided by PBS viewers. Robert Wood Johnson Foundation and the California HealthCare Foundation. 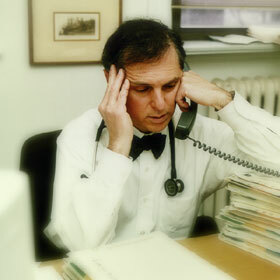 In the 1990s, cost-cutting HMOs were reviled as the enemy of doctors and patients. After fighting to regain control of the medical process, doctors are now struggling to manage tough financial decisions as well as patient care. On a daily basis, doctors find themselves faced with the often excruciating responsibility of balancing quality care against their own bottom line. FRONTLINE correspondent Hedrick Smith goes inside one of Harvard Medical School�s premier teaching hospitals and discovers Dr. Martin Solomon, a highly rated primary care physician, embroiled in the most bitter conflict of his career. He and his colleagues battle with each other over cutting costs, worry about the impact of red ink on their own income, and fear the struggle between care and costs will not only damage quality but will ultimately tear apart the trust between doctors and patients.